UPDATED – KINSHASA, Congo (CNS) — Congolese church leaders, including the nation’s cardinal, condemned security forces’ attacks on Catholic protesters that left at least five dead and 120 people detained. The nunciature also updated the number of dead and churches involved. The Dec. 31 protest against rule by President Joseph Kabila was organized by the Kinshasa archdiocesan lay coordination committee. At least six priests and a seminarian were among those detained. “We condemn with utmost vigor this unjustified violence,” the Congolese bishops’ conference said in a statement Jan. 2. The statement said the bishops were “profoundly shocked by such ignoble acts,” and would demand a “serious and objective inquiry” into who was responsible. Police also used tear gas and batons against Massgoers in some of the capital’s parishes and violently broke up attempted marches in which protesters demanded fresh elections in the country. The nunciature said 134 churches were surrounded by police, and at least two parishes were not permitted to celebrate Mass Dec. 31. In five parishes, Mass was interrupted by security forces. 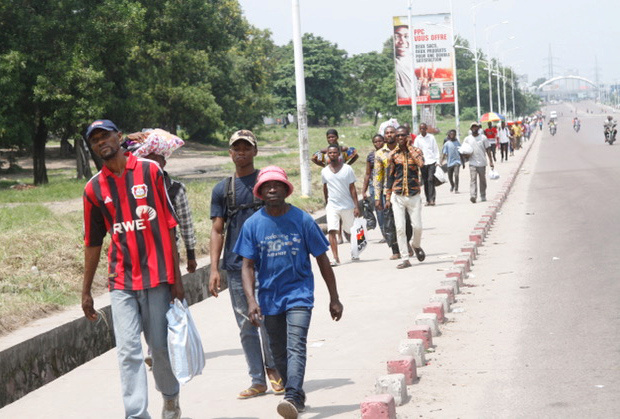 In a statement, Cardinal Laurent Monsengwo Pasinya of Kinshasa called the response “nothing short of barbaric.” He said people at Mass, armed only with Bibles and rosaries, were attacked with tear gas. A U.N. spokeswoman initially said seven deaths had been recorded in Kinshasa, and another at Kananga. Congolese authorities denied that the deaths were linked to the protests, but the nunciature documented the parishes where the five deaths occurred. The Catholic Church makes up around half the 67.5 million inhabitants of Congo, and the bishops have pressed Kabila to step down since his second and final term expired in December 2016. Later, a church-brokered accord allowed the president to stay in office, alongside an opposition head of government, pending elections by the end of 2017. However, in November, Congo’s Electoral Commission said the ballot would be postponed until Dec. 23, 2018. In a November statement, the bishops’ conference said church observers had recorded 56 deaths and 355 arrests in half a year of opposition protests. They urged Kabila to release political detainees and stick to the Dec. 31, 2016, accord. The rector of Kinshasa’s St. Alphonse Parish, Msgr. Hugues Ndongisila, told Radio France Internationale that police had beaten and robbed Catholics when they sought refuge in his church, also shooting out its stained-glass windows. He said the bodies of two dead protesters had later been collected by the Red Cross.